Note: Cotlook services are provided as secured PDFs. Access to our services requires the download and installation of a proprietary PDF reader. Further information is available in our FAQ Section or Make an Enquiry. The service includes three daily market summaries, covering the Chinese market, North American markets and news from the rest of the world. A database package including the Cotlook A Index and its constituent growths, other non-Index CFR Far Eastern quotations and more. A weekly round-up of the news available in digital format. 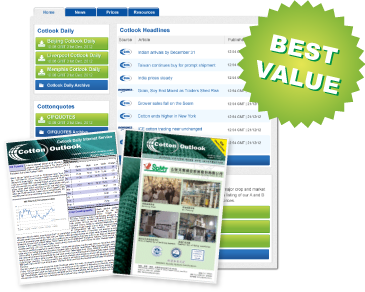 Buy electronic downloads from the eStore – available services include COTTON OUTLOOK and monthly cotton price data.